Golden Cross had a good awards season last year with its eponymous goats cheese winning super gold at the World Cheese Awards and named best soft white at the British Cheese Awards. Not that owners Alison and Kevin Blunt were there to receive them. The couple are so busy making the St Maure-style cheese that they find it difficult to leave their farm near Lewes in East Sussex for any great length of time. Apart from walking to the farm gate to collect the post, Alison calculates that she hasn't been “off base” for the best part of a fortnight when I visit in early March 2015. Meanwhile, Kevin recounts how he had to miss one of their three sons playing at Lords in the final of a national village cricket competition because he had to be at the farm milking the goats. 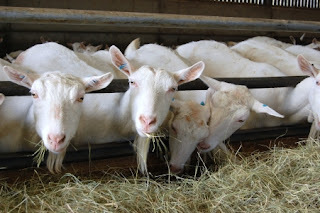 The farm has a 230-strong herd, which is milked all year round, and although Golden Cross is technically made on alternate days, in reality the hand-ladelled raw milk cheese needs tending every day. 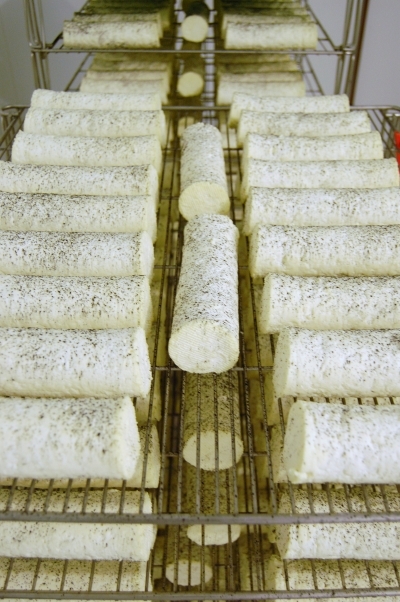 In addition, the company produces another goats cheese called Chabis and a mould ripened sheep's cheese called Flower Marie, which require similar levels of care and attention. 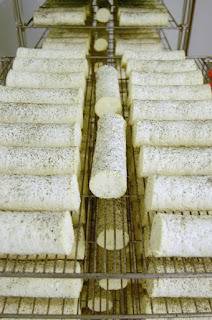 The hands on approach is a world away from some of the big goats cheese factories where curd is extruded into long sausages and sliced into perfect logs, she explains, as she wraps speckled white batons of Golden Cross ready for despatch (a time consuming job in itself). Despite all the hard work (or perhaps because of it), it's clear that the couple have a great love for what they do and enjoy working together. Their dedication certainly pays off when it comes to the cheese. Golden Cross is a modern classic. Zingy and fresh with a velvety texture when young, it becomes denser, creamier and more intense as it matures with a lovely gooey breakdown just under the white fluffy rind. To continue reading this article, which first appeared in Fine Food Digest, click here.